HRH The Prince of Wales has visited HF Holidays at Thorns Hall in Sedbergh to mark the centenary of the walking holidays company. 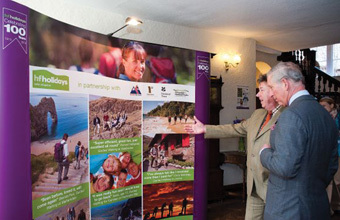 During the visit, which formed part of a day of engagements in Cumbria, His Royal Highness met members of HF Holidays and talked to guests enjoying a walking break at Thorns Hall. HF Holidays' chief executive Brian Smith said: "We are honoured and pleased that The Prince of Wales took the time to visit one of our country houses and help us celebrate our centenary year."